Bees and wasps are often seen as dangerous pests because of their famous ability to sting. This fact certainly makes them a hazard to humans, particularly those who might be allergic to the venom in the sting. Their love of man-made structures and food sources also bring them into contact with people, creating the opportunity for a painful sting. Despite these attributes, bees and wasps are actually beneficial insects. Many varieties are responsible for pollinating your garden flowers and vegetables. They perform the same service for commercial growers and agricultural crops. Some types of wasps eat other pests in your landscape like various larvae and damaging aphids. Stinging insects aren’t all bad! Honeybees should be left alone if at all possible or removed by a qualified beekeeper. Honeybees have suffered great losses in numbers as pesticides have become more common and as fungi and parasites have begun to spread even to cultivated hives. Some species of wild honeybee have already been lost and many are under the threat of extinction. 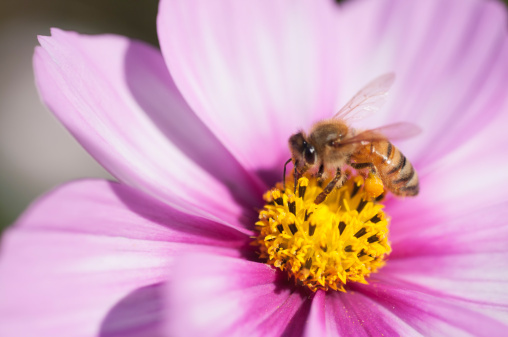 Since honeybees are prolific pollinators, their presence is greatly needed for the propagation of plant-based foods. About 1/3 of the produce grown in the US is dependent on honeybees. If you happen to find a honeybee hive on your property or home, call a qualified bee keeper to move the hive rather than destroy it. Most people use the word “bee” to describe any flying insect in any shade of yellow. There are differences between bees and wasps, both in appearance and in behavior. Wasps have slender bodies with a distinct waist that almost appears cinched. They also have an almost shiny surface. This includes yellow jackets, hornets and paper wasps. Bees are generally more hairy or fuzzy and their bodies are more compact. Bumblebees and honeybees are examples of this category. Food sources are also different for bees and wasps. Bees are only interested in nectar and pollen. If the insect in question is going from flower to flower, it is probably a bee. Wasps are predatory and often feed on other insects. However, in the fall when the queen stops laying eggs and the workers are ejected from the hive their behavior will change. They will aggressively seek out carbohydrates, like your soda or the watermelon from your picnic. Controlling the population of both bees and wasps on your property is important for the health and safety of the people living there. The best way to keep your family safe is through integrated pest management methods. Inspection, sanitation and correction are needed in addition to eradication. A pest control technician should inspect your property for any active colonies of bees or wasps. He should look and listen inside walls and on the ground in addition to checking the eaves of your house and the surrounding trees. He should also be looking for the things bees and wasps like to eat and the places they like to live. He should then make recommendations as to sanitation. This doesn’t mean your home or office is unsanitary or “dirty”. Sanitation in this case means reducing or eliminating the resources available to the pest. In the case of bees and wasps, that is food and water. A dripping hose is just as big a sanitation problem as an open trash container. Your agent can help you correct any problems he finds. He can suggest ways to prevent an infestation from occurring at all. He can also create a plan to eradicate any active hives or colonies with minimal impact on your children or pets. Repeat visits will help prevent new bees or wasps from colonizing your home in the future. An integrated plan of prevention and treatment will be the long-term solution for you family’s safety.